The addition of the Sighting Pro camera system to the TDS product line has made a significant change to many of the TDS camera related products. The inclusion of a full strength PC internally in the camera enclosure now eliminates the need for a stand alone processor (roadside or booth mounted). 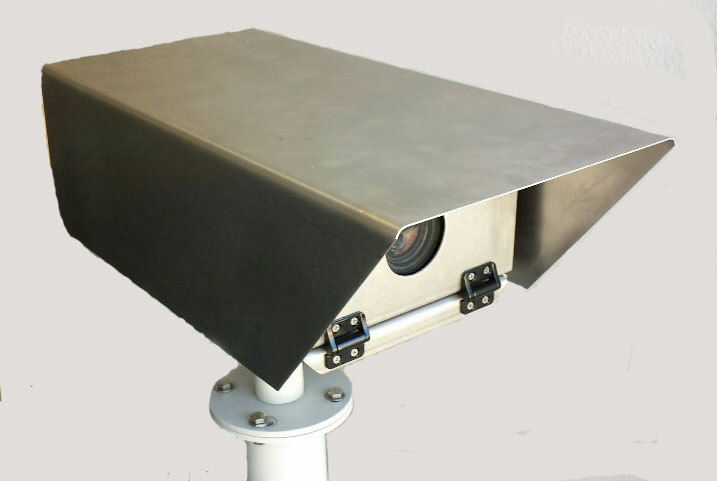 Furthermore the ability to auto detect vehicles using the video stream and to do license plate reading inside the camera enclosure brings new levels of sophistication to parking lot systems. The most basic TDS GateGard system is a stand-alone single-lane camera system designed for an unmanned entry gate. It captures images of all vehicles passing through the gate. One of these units is placed in every entry lane into the gated community. In a gated community with multiple entry points, data from each of the entry lanes are then transferred in a central PC. This allows security personnel to be able to scan all vehicles that entered the community since the last upload of data from the lanes. This is accomplished by having a security person/technician go to each entry lane and download the time stamped video data using a wireless link built into the camera system. A license plate reading capability may be added to the system, either in the lane camera or in the central facility. This extracts the license plate number from the vehicle image. This allows security personnel to quickly search the image database for a given license plate of interest. The addition of a data table of vehicle license numbers of the permanent residents of the community allows the security person to only view vehicles that that do not or do not reside in the gated community. Increasingly, gated communities are relying less on security personnel and more on license plate reader systems to monitor the entry of vehicles into the community. Maintain real time central surveillance of all vehicles as they enter the gated community. Maintain a real time single data table of resident vehicle images and their associated license numbers . Maintain a black list of unwanted vehicles and automatically compare incoming vehicles in real time. Alert security personnel when an unwanted vehicle has entered the gated community. Some gated communities have manned booths in every entry lane. The TDS GateGard system can be configured to provide a display and a keypad inside the booth. This allows the guard to grant access for authorized vehicles only and prompts security checks on all other vehicles, thereby improving security and increasing community safety. A physical gate or a traffic light can be added to the system if desired. As a vehicle approaches a gate, its license plate is read and compared to a list of valid license plates for that facility. If a matching plate (authorized) is found, the guard is notified via the display. If a physical gate is included, it can be automatically opened to grant access to the vehicle. The guard will have the ability to manually open the gate if so desired. If a license plate cannot be read, or if no matching plate is found in the database (including authorized license plates and temporary guests), the system will indicate this information to the guard. All transaction information, including images and license plate reads, are stored in the local database for later review. The Gategard system can also be configured for a dual lane entry gate where one lane allows resident to automatically enter the community using an entry device (keypad, tag reader, etc.) . The second lane is manned for those vehicles which do not have the necessary tag or entry information. It is assumed that exit from the gated community is via a one-way exit barrier. The addition of a camera system in each exit lane provides the ability to increase security in the facility and maintain an inventory of the vehicles in the facility at any given time. In its simplest form the license plate of the vehicle is read and a transaction sent to the database in the Central Processor. The database is updated and can be polled to provide an inventory of vehicles in the facility. The GateGard system is very scalable. Once a centralized server has been implemented, additional gates can be easily added to the system.